This week, GlobalVision released on the Amazon Kindle Enabling Globalization- A Guide to Using Localization to Penetrate International Markets. If you like our blog, you will love the eBook! We’ve built this 120-page guide because despite the need, nothing like it exists: a concise, step-by-step handbook for globalization and localization in the new millennium. Companies come to us with a desire to go global but unsure of what the process entails. Some face a Catch-22 dilemma. They want to penetrate international markets, but cannot justify the localization costs. 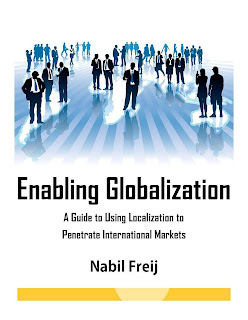 Welcome to Enabling Globalization− A Guide to Using Localization to Penetrate International Markets. Here you will find the practical advice you need to start on your way and follow through to a successful finish. So, whether you’re just entering the wide world of globalization or you’re a veteran of the field, this guide is for you. We invite you to take a look inside the industry through the eyes of a successful localization and translation company. Enabling Globalization will enlighten and inspire you – and leave you eager to tackle your next international market! You don’t have a Kindle? A PDF edition will be available from GlobalVision opens in a new window. Contact us for more info! Next:Machine Translation Engines put to the test!